Santa Clause came to town…. or at least someone looking like Santa came to the Kids’ Christmas Party. 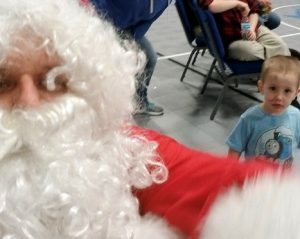 The kids enjoyed a last day of the semester filled with activities, games, and a visit from “Santa”. Earlier in December, the staff enjoyed a Christmas party together. This is one of the few times during the year that the staff can gather together, without kids, and simply enjoy being together. 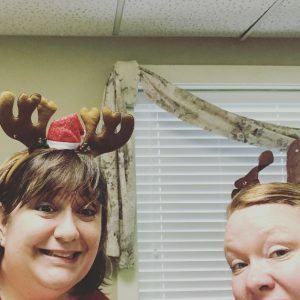 We reveal Secret Pals, play “Mean Santa”, and this year, we enjoyed a video of memories from 2018. We really cherish the time we have as a whole staff together. December was filled with guests and activities. One yearly tradition is Egg Nog & Treats Day where we gather to enjoy some Egg Nog from Sheilla Davis, a retired employee who visits and prepares a yummy egg nog for all to enjoy. This is one of our favorite days because several of our retirees come and join us for some treats and laughs. Speaking of treats, we had our annual cookie exchange. From sugar cookie Christmas trees to buckeyes, we shared some amazing goodies. It’s a good thing that we had kicked off our month with the workout at a local gym because calories were abundant in December. December’s Theme of the Month was “Foundation of God’s Love”. The idea of all of our commitments—open communication, emotional intelligence, democracy, growth & change, non-violence, social learning, and social responsibility—all echo the way God expects us to treat each other. So with that in mind, we used the month to recognize the commitments we have seen in each other during 2018. Every resident and staff member received an ornament filled with commitments that everyone else saw in them during 2018. 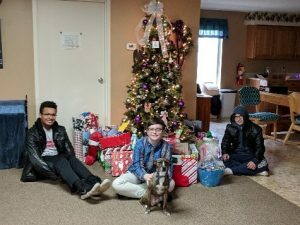 Our kids were blessed by several congregations, individuals, and local friends who provided Christmas presents, goodie baskets, and so much more for the holiday season. We are so grateful for the outpouring of love that occurs during the holidays for our kids. By the Sunday before Christmas, the boys were nearing the end of their patience and were ready to start ripping into their presents. They were so excited!! All of our kids were truly blessed and were very appreciative of everything they received. As we file away our 2018 calendars, and begin to plan and dream for 2019, we just want to thank you for everything you do for our kids. Responding with God's love to serve and strengthen children and families!